Each project developed by the PBC embraces the type of positive social change that only public development can deliver. In neighborhoods throughout the City of Chicago and Cook County, the PBC works with the community to transform rail yards into schools and concrete into campus parks and provide facilities where residents can gather to share the common values that truly build our communities. 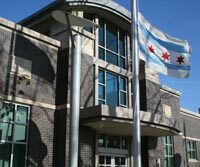 The Public Building Commission continues to forge ahead with other efforts to enrich and rebuild communities by replacing and updating police stations, fire houses and libraries, renovating and building new Chicago Public Schools and City Colleges of Chicago, and building new recreational facilities for the Chicago Park District. The PBC has also led the way to become the primary provider and integrator of integrated surveillance systems for the City of Chicago and her sister agencies. In a progressive effort to simplify the construction process, meet or surpass aggressive deadlines and streamline costs, the PBC has developed prototype – or standard – designs for schools, police stations, fire houses and libraries. The use of prototypes reduces time spent on site selection and acquisition, utility relocation, building design and permit approvals. Ultimately, the prototypical approach translates to big savings on total development costs as well as faster and more efficient delivery of buildings and facilities with the very best life-cycle returns.